At a meeting of the Teesside Archaeological Society in the early 90’s, I first met Howard Carter, shortly after foolishly suggesting to the committee the idea of a TAS fieldwork group. Foolish in the sense that my suggestion with lightning speed, resulted in my instant co-opting(pressganging) onto the committee as fieldwork officer, which would soon ensnare me into a very polite pressganging into the role of secretary of the society. Anyway I digress, as the newly empowered fieldwork officer I stood up at a lecture to call for volunteers. Howard was a very private man, who was already retired when I met him, I know he worked for HM Customs during his career, but just like Ted Coles who I talked about recently, retirement seemed to be just work continuing along a different path. 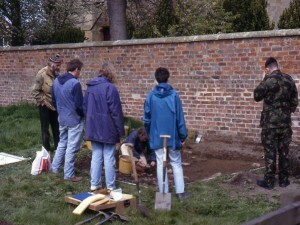 I am also not really familiar with the archaeological background of Howard, although if his commitment to our project was any example, he would have been a valuable asset on any site he worked on. In researching for this essay, it struck me that Howard had worked on every project I had organised. Once you met Howard his trademark Tam o Shanter and long beard made him unforgettable. 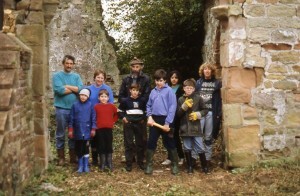 One of our first areas of interest for the fieldwork group was Sockburn which included a group activity to remove the trees and shrubs that were growing in the stone work of the church, slowly breaking it apart. Another dig was at Newton under Roseberry adjacent to the church wall, and carried out as a result of our first use of the Martin Clark Resistivity meter donated to the group by Robin Daniels of Cleveland County Archaeology. This was the Mk 1 resistivity meter meter designed for archaeology, requiring each reading to be manually recovered using manual potentiometer adjustment, in which took an age to do a couple of dozen readings. The meter was the result of work by Anthony Clark who wrote about and developed geophysical techniques long before ‘Geophysical’ or ‘Geofizz’ became cool buzzwords. His book ‘Seeing Beneath the Soil’ is still essential reading for those interested in geophysical survey. The survey did show an exciting looking linear next to the churchyard wall, which on excavation initially looked like a parallel wall, unfortunately it turned out to be a ditch filled with stone acting as a soakaway for the boggy ground. 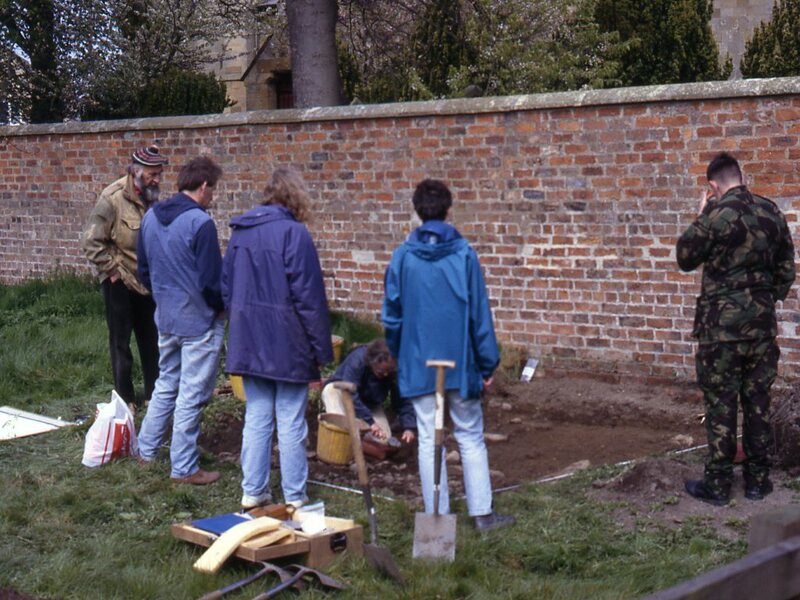 Howard was always there to offer advice and the occasional pithy comment, but it was at Dalton on Tees where like Ted Coles he showed his commitment to the archaeology, spending every weekend on site fair weather and foul, for the whole year we excavated there. Only towards the very end of the excavation did we lose Howard, who unknown to us had been in the final stages of terminal cancer for some time before succumbing, yet had continued digging near enough to the end. One of Howard’s trademarks was a hand held auger from his Customs and Excise days which was used to sample the contents of sacks full of raw materials in traditional cargo ships in the pre container age. Howard was rarely without this useful tool, and it was kindly donated to me on his passing, something I was using as recently as last weekend. As well as our current volunteers, I intend from time to time to post a brief bio of amateur archaeologist friends who sadly are no longer with us. I first met Ted Coles in the in the mid 1990’s, when I was leading the fieldwork group of the Teesside Archaeological Society. Ted on retirement had recently moved into the area from London to be closer to his family. Ted had worked on a number of big digs in the London area, and had an eclectic range of interests including the study and recording of stone horse troughs. Our Roman dig on the villa at Dalton on Tees was the first time we actually worked together, and Ted soon became one of those amateur archaeologists who become indispensible to the project, We excavated at Dalton for a full year on weekends right through a pretty cold winter, and the one certain thing was that fair weather or foul Ted would be on site. One of my defining images of the dig is Ted, and another stalwart Howard Carter on site with a hard frost on the ground, moving around wraith like in the misty low winter light. 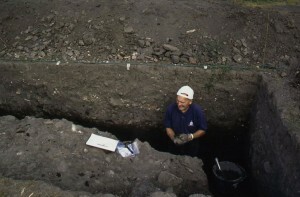 The image I have published above Ted having a session excavating a large ditch 7m wide, and at least 2m deep at Dalton (we excavated half of it). This ditch is part of what appears to be pre-Roman tripled ditched hill fort style of defence, postioned against the steep scarp down to the river. This part of the ditch ran very close and parallel to the gable end of the large ailed building, and our trench is adjacent to a doorway into the building. The gable end of the building was rebuilt or reinforced on at least one occasion, presumably its proximity to a large open ditch made the structure inherently unstable. The surface you can see with the bags and tools on it, is a layer of broken stone roof tiles that seem from their layout to have collapsed as part of a roof structure into the ditch. In a lower layer there are terracotta roof tiles suggesting at least one re-roofing of the structure. The ditch was well stratified and appears to have slowly been filled up with domestic waste over the occupation period of the site. Inconveniently time restrictions at the end of the dig meant we never managed to bottom the ditch due to its unexpected size. We did however recover pottery from the 2nd century all the way through and including late 4th/ early 5th century Huntcliffe ware. 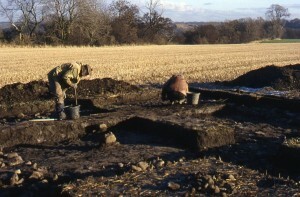 On top of the Huntcliffe ware, stratified native style pottery similar to the earlier local Iron Age type was present. In the late 1990’s work pressure took me away from archaeology, but Ted continued to dig on projects throughout the Tees valley, with several years excavating with Steve Sherlock at Street House. In the photo above Ted is about 68, I’m not sure of his exact age when he passed away. I would imagine he was around about 80 when I bumped into him at Street House a year or so before his death, still digging enthusiastically, still committed to his archaeology as the guy I had met shortly after he retired some 15 years earlier. People like Ted put a whole new perspective on the concept of keeping busy in retirement. Ted perfectly demonstrated that retirement doesn’t have to be all daytime telly, tea dances and a season ticket to the GP once you pass 65, and that age really is a state of mind.